We're all so lucky to have been babies in a pre-internet age. There was no stress about being the most popular baby on Facebook. There was no pressure to be the most talked about toddler on Tumblr. All we had to do was sit around, poop our pants and maybe — just maybe — you'd be lucky enough to end up on Romper Room or, if you were really destined for fame, fall down a well. Now, it's all different. Parents are putting photos of their kids on Reddit and Instagram and people are responding. Cute has become a contest — a contest that many are saying that Boston's Joey Powling Jr. has already won. 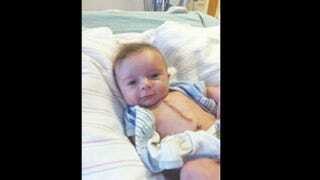 Joey Powling Jr. (or Baby Joey as he's known 'round the 'net) was born with tetralogy of Fallot, a defect that caused him to have a hole in his heart. Thanks to early screening, Baby Joey was diagnosed while still in utero, giving his parents and doctors time to prepare for his treatment. At three months old, the infant underwent open heart surgery at Boston Children's Hospital and, 5 days later, his mother Sarah snapped a photo of the jagged surgery scar that runs from his navel to his collar bone. What his mom didn't plan on was for Joey to look at the camera and smile calmly as she took the picture. Through a family member, the photo was put on Reddit where it eventually received enough upvotes to move it to the site's front page. It's also been shared across Facebook and other sites, having been viewed an estimated million times. Folks have gone so gaga for Baby Joey that he's now been internet-dubbed "ridiculously good-looking surgery baby" and "baby Bruce Willis" (the latter, we can assume, refers to his toughness and not his looks). The kid has a long health battle ahead of him — one which the doctors are very on top of — but at least he has this photo to coast on for the rest of his life. "Do you know who I am? I'm BABY JOEY" ought to get him to the front of a lot of lines one day.